When companies throughout the United States are looking for office desks, they turn to Reimagine Office Furnishings (ROF). 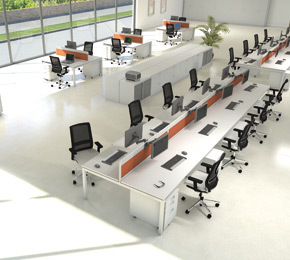 Beginning in 1991 in Tampa, FL, ROF has now grown to be a nationwide seller of virtually all types of office furniture. We operate a 140,000 square foot facility that allows us to house a wide variety of office desks, so business owners can always find what they need with us. New – We exclusively sell commercial grade office furniture, so you can trust that new desks from ROF will maintain their beauty for years, even throughout heavy daily use. Used – Our pre-owned desks are from noted manufacturers like Indiana Furniture, HON, Allsteel, and Herman Miller, so you can trust that affordability doesn’t come at the expense of quality. Refurbished – With our refurbished desks, we have an in-house team that fixes up our desks, and other pieces, to make them look and function like-new. Plus, our close proximity to the Port of Tampa and Tampa International Airport allow us to ship orders quickly and efficiently. So, no matter where your business is located, ROF can help furnish your office with affordable, well-made, and attractive office furniture. To see what types of office desks we currently have in stock, or for more information on the other types of office furniture we sell, contact Reimagine Office Furnishings today.